Attachments are files that are attached to AODocs documents. 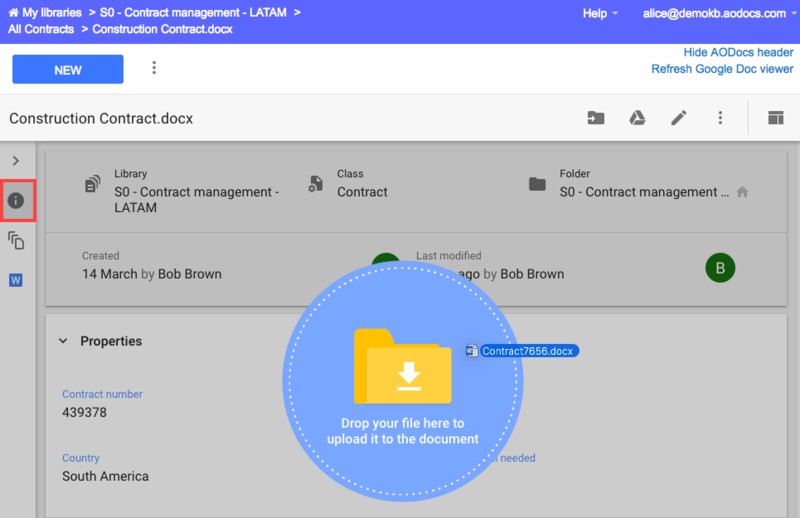 Attachments are stored in Google Drive and are owned by the storage account of your library. Learn more: What are attachments? - You can upload non-Google attachments only. - Document Management libraries have more extensive options for adding attachments than Team Folder and Secured Folder libraries. 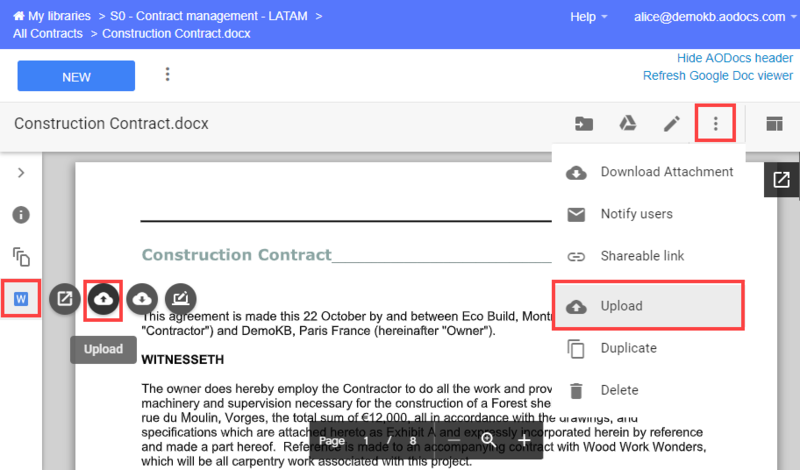 This article explains how to upload non-Google attachments to your AODocs documents. When you upload a new version of an existing non-Google attachment, you must choose to keep the current version or to overwrite it. Learn more: Understand the AODocs version control system. 1. Open a document in any type of library. 2. In the sidebar, press the Upload button next to a non-Google attachment. In Secured Folders and Team Folders you can also select the Upload option from the More actions menu on the right of the Properties panel. In Document Management libraries you can also access attachments in the Properties panel, under Attachments. Important: You can't upload attachments as new versions when the document is in edit mode. - If manual versioning is disabled in your document class, the option Create a new version of the existing attachment is not available. - The Virtru option is not currently available for the upload feature. 4. Press Choose file to select the file to upload. 5. If you chose to create a new version of the existing attachment in step 3, enter a name and (optionally) a description for the new version of your document. Note: You can’t use the same name as another version of the document. 7. If you chose to replace the existing attachment in step 3, you can press the Upload button directly without entering a version name and description. Any new version of the file you upload must have the same Multipurpose Internet Mail Extensions (MIME) type as the previous version. For example, you must upload a Word file to replace a Word attachment. - Documents in Team Folders and Secured Folders must contain exactly one attachment. - When you upload a new version of an existing attachment, you must choose to keep the current version or to overwrite it. Learn more: Understand the AODocs version control system. 1. Open a document in a Team Folder or Secured Folder. 2. Open the Properties panel. 3. Drag and drop a non-Google file into the Properties panel. The file must have the same Multipurpose Internet Mail Extensions (MIME) as the existing attachment. For example, you can upload only an Excel file to replace an Excel attachment. 5. Press Choose file to select the file to upload. 6. If you chose to create a new version of the existing attachment in step 4, enter a name and (optionally) a description for the new version of your document. 7. If you chose to replace the existing attachment in step 4, you can press the Upload button directly without entering a version name and description. Any new version of the file you upload must have the same Multipurpose Internet Mail Extensions (MIME) type as the previous version. For example, you must upload a Word document to update a Word attachment. Note: Documents in Document Management libraries can have no attachments, one attachment or several attachments. Learn more: Manage document attachments in Document Management libraries. 1. Open a document in a Document Management library. Note: You can only drag and drop one file at the time. If you select multiple items, the first one you selected will be the only one added. 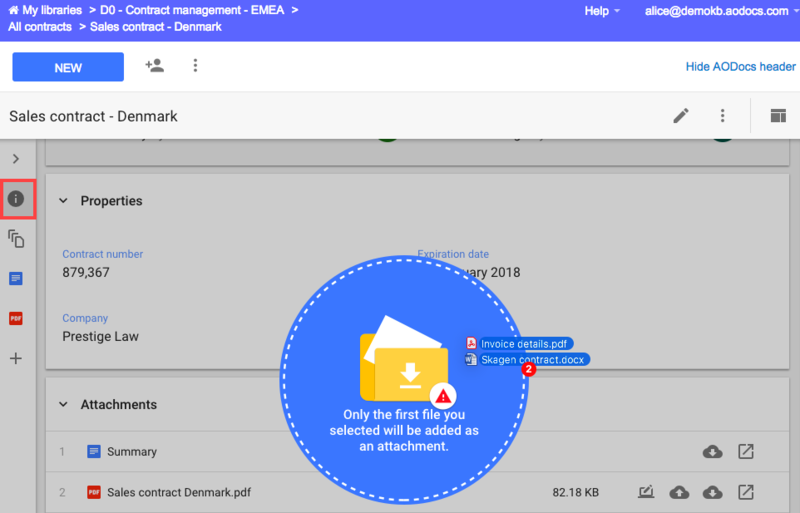 Note: If you select this option in a document that has two or more attachments with identical names, the uploaded file replaces the first of the attachments with identical names. 6. If you chose to create a new version of the existing attachment in step 4, enter a name and a description for your new version. If you didn’t find what you were looking for, don’t hesitate to leave a comment! can help your department succeed. In Polynesia, AO are the gods of the clouds. There are 13 original gods who represent the clouds in their diverse forms. AOTakawe is swift, the gods of the scurrying clouds, AOPour is mean, the god of the black threatening clouds and 11 other god-brothers and god-sisters. AODocs is the 14th god, he is the youngest and tidiest of cloud gods. He always keeps the clouds organized and structured.